Nan and Byron’s is a new restaurant in Charlotte by the folks who brought you 5Church. I understand that 5Church is upscale (I haven’t visited yet) and they bring the same care for their food to Nan & Byron’s but the prices are pretty amazing. We arrived at the restaurant, located in the old Vinnie’s Raw Bar on South Blvd, a little earlier than our reservation time of 8:30 p.m. We were told to have a seat and we’d be seated at our table close to our reservation time. Once we were 5 or 10 minutes past our reservation time, the manager came over to apologize for our wait and brought us 4 drinks of our choice for our trouble. Wow! Actually not a bad move, because we bought 4 more plus our dinner beverages. Still, the gesture was welcome. It set the tone for what was to be a great evening. Before he even got back with our drinks, we were seated at our table. We were by the bar and near a large party, so the noise level was a bit loud for me, but this time of year, that is to be expected. 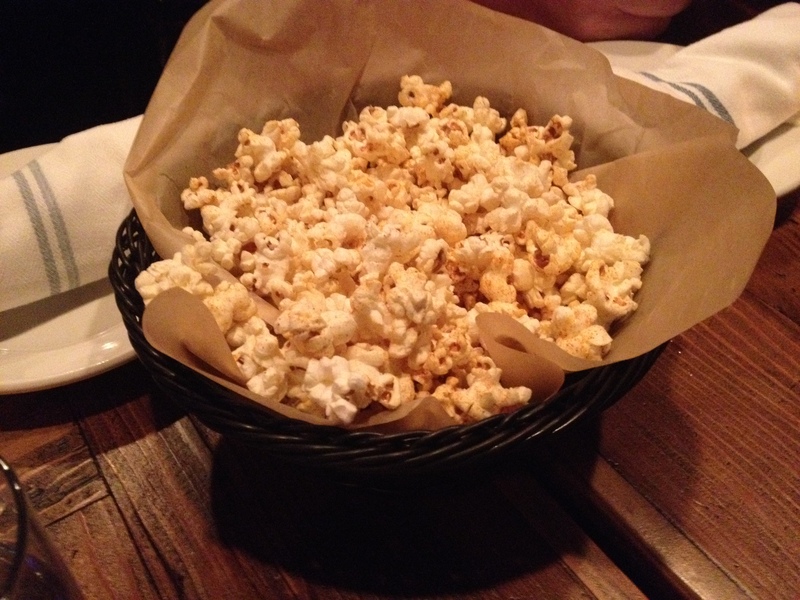 We were brought our *free* drinks and some yummy chipotle spiced popcorn for the table. It was a welcome, and somehow hip change from the normal bread and butter. 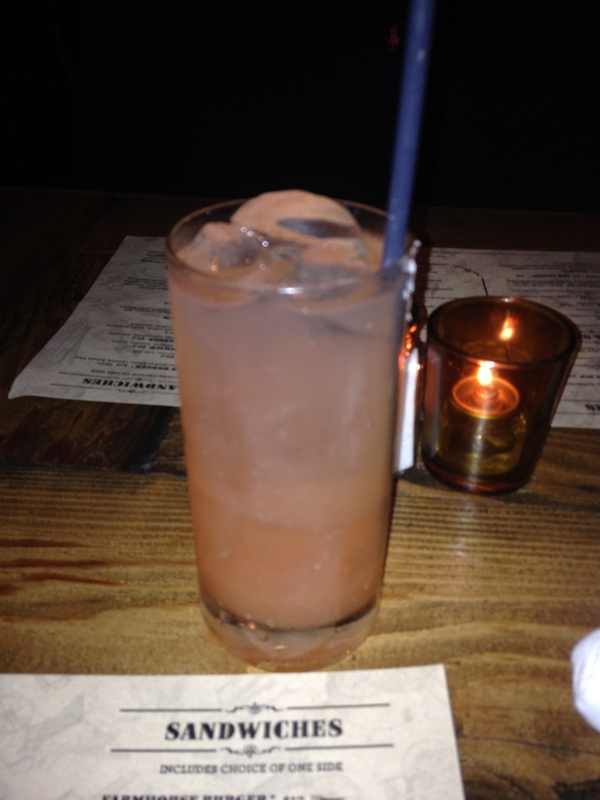 The drinks we tried included (but were not limited to) Farmhouse lemonade and the Cadillac Jalapeno Margarita. All were pronounced yummy, but they are a little on the pricey side. Please remember, the food is a bargain, so they have to make their money somewhere! 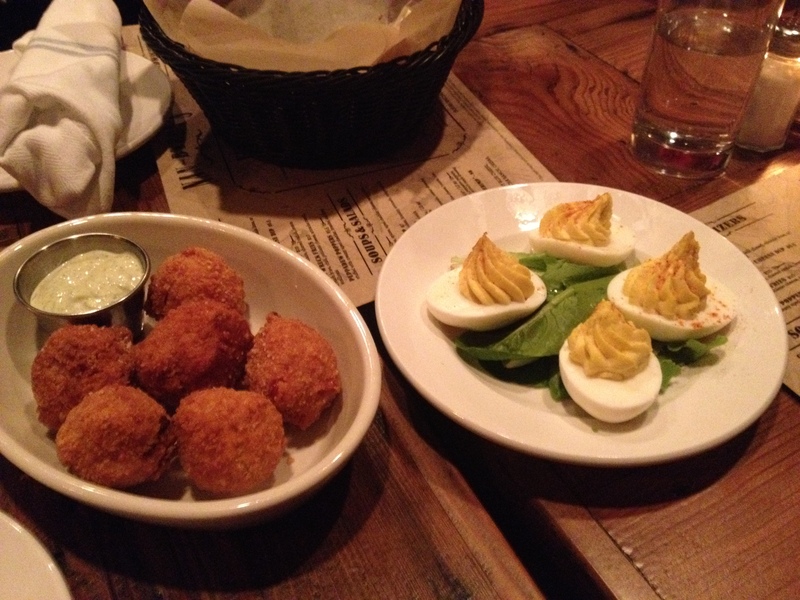 For our appetizers, we ordered Deviled Eggs and Peppedew Poppers. The deviled eggs were so pretty, they tasted nearly as good as they looked. What was very present was a vinegar taste that I thought was a little overwhelming. Still, creamy and delicious! The Poppers were little fritters full of nuclear hot cheese. I took one bite, it spewed on me, dripping on my shirt and burning my lips. So, my tip to you is this…use a fork. No fun with pick up-ables, but trust me, save your shirt and your tongue. You don’t want cat-tongue for the rest of your meal. Once we learned to properly eat the poppers, we discovered them to be more than delicious, breaded nuggets with a fresh dipping sauce that was very herbaceous. 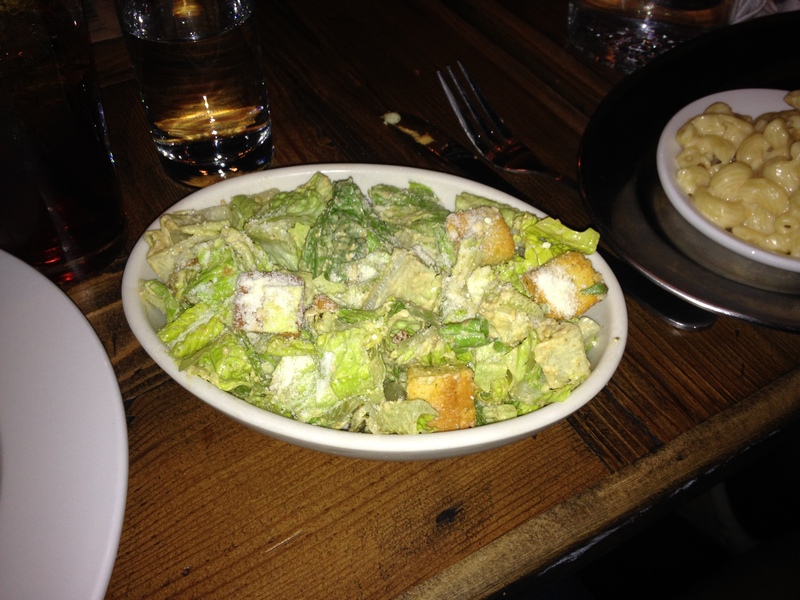 My dinner came with 2 sides, so for one of my sides I opted for a Caesar salad. The romaine lettuce was chopped into bite sized pieces making it simple to eat, which pleases me greatly. The dressing is very tangy and it is served teeth-chatteringly cold. Sprinkled atop it all was grated Parmesan cheese which gave it a salty bite to perfectly contrast the croutons. I loved it. The entrees were presented so lovingly and were almost too beautiful to eat. 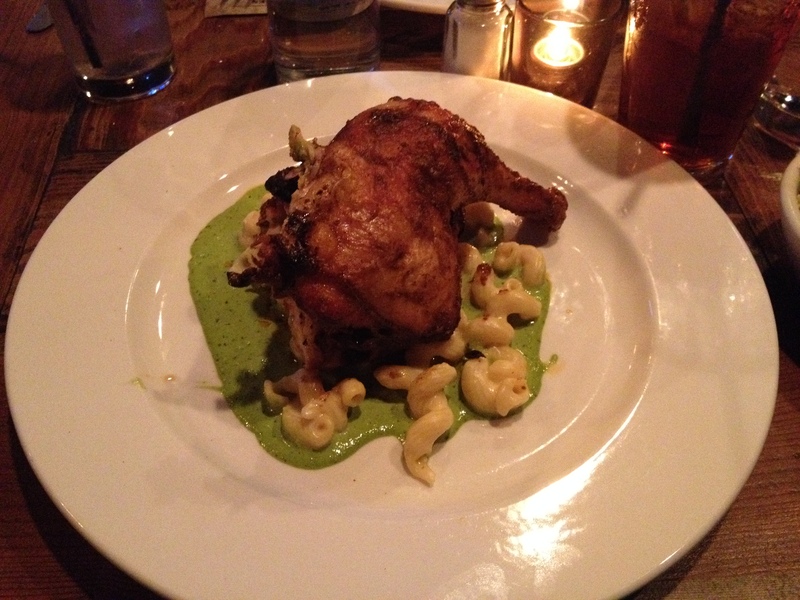 I got the chicken, which was a 1/2 chicken roasted in Peruvian spices and sitting atop some spicy green sauce. 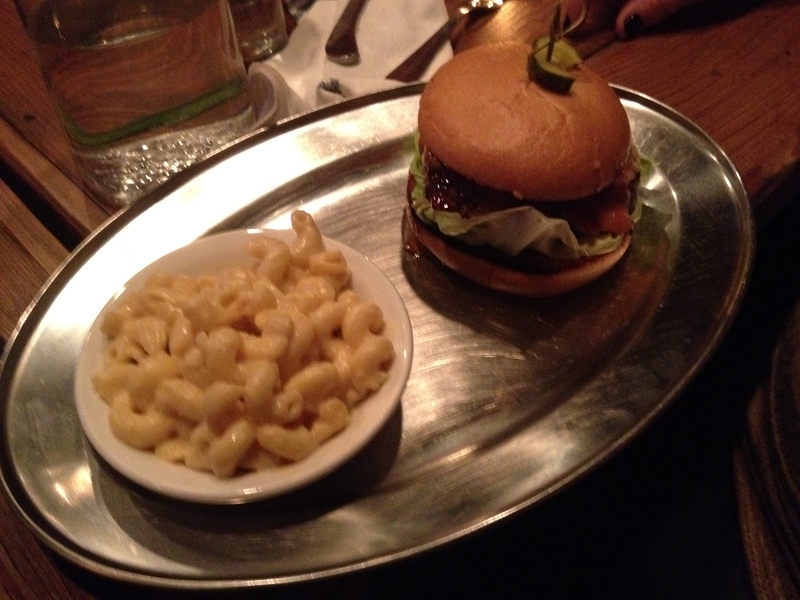 My other side (besides the salad above) was the macaroni and cheese. They were pretty skimpy with that. Luckily, the deliciousness of the chicken more than made up for this. It was so tender, and juicy! The spices were perfect, not too overpowering, smoky and sweet. It all worked together, perfectly. I will be hard pressed to try something new next time I go. The guys got the meatloaf. It is described as seasoned ground beef topped by sriracha ketchup and red wine sauce. 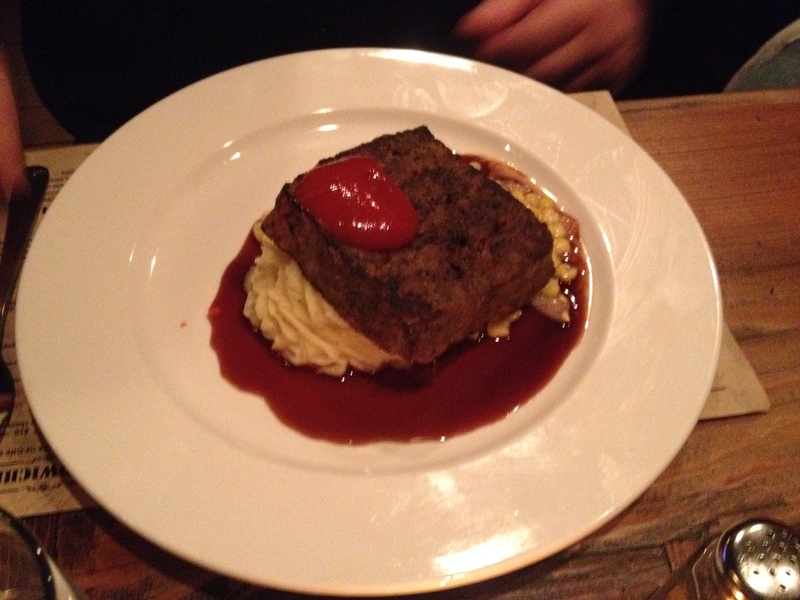 I only got a tiny taste, but it was really good meatloaf. Tender, not greasy at all, and that ketchup. Wow. Nan needs to bottle it and sell it. Dustin opted for double starches with mashed potatoes and macaroni and cheese. It worked. The last entree we sampled was a sandwich. My friend got the Farmhouse burger and she was very impressed by all of the different flavors going on: spicy cheese, smoky sauce and salty bacon top the nicely seasoned ground beef. Yummy! Desserts are not “officially” on the menu yet (at the time of our visit) but we are told they are made by the pastry chef at 5Church and brought over, so the menu changes seasonally or to the whims of 5Church. We tried the Berry-Apple Cobbler, The Brownie and the Whoopie Pie. 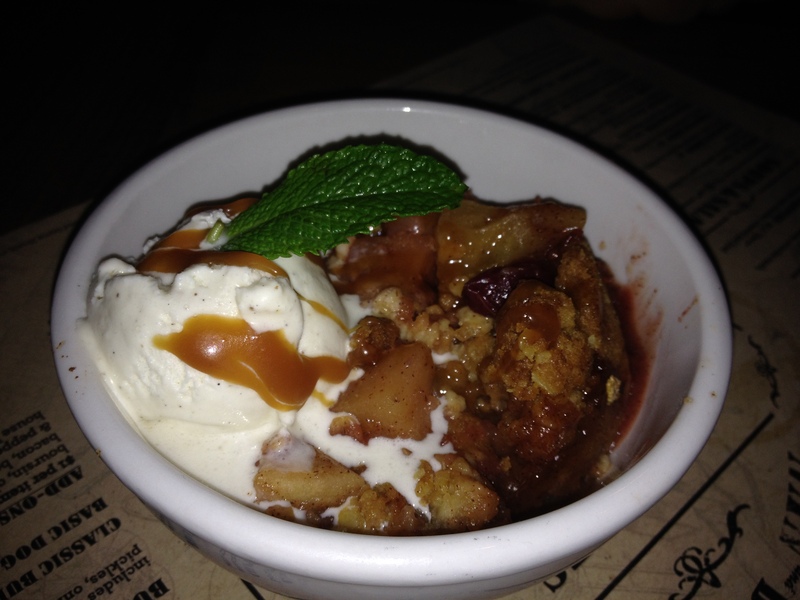 The Berry-Apple Cobbler was ho-hum and had an odd sort of processed taste to it. I wasn’t impressed. 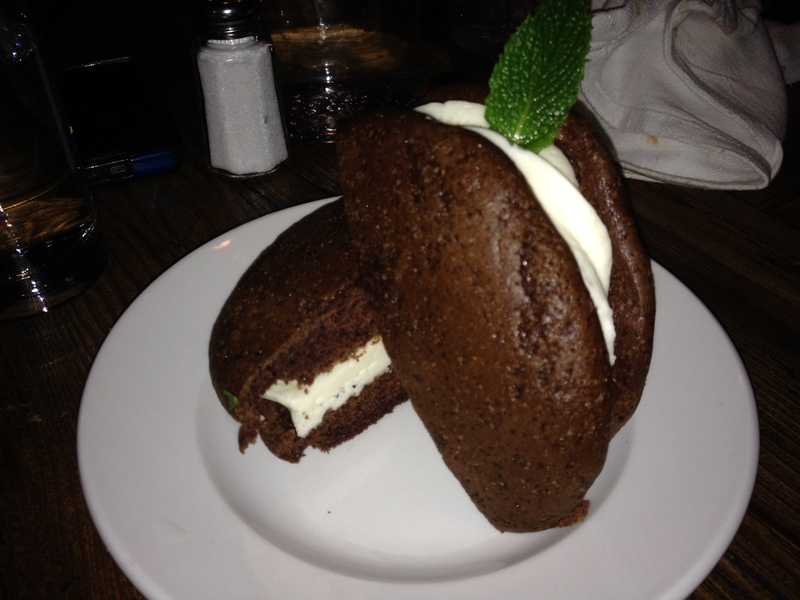 My friends got the Whoopie Pie, and they said it needed ice cream or something to combat its dryness. Mine however, the Brownie, was a.maz.ing. 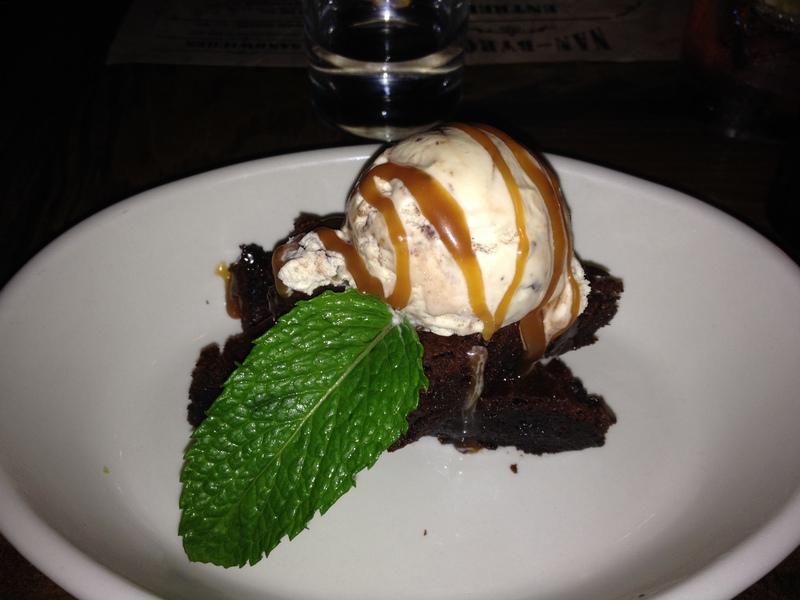 The brownie was warm and gooey, the peanut butter ice cream that topped it was a perfect rich accompaniment. I wish I had one now. This new restaurant is an exciting new concept for Charlotte, at least to my way of thinking. Our reservation at 8:30 p.m. led us to be one of the last “diners” in the joint, which began to fill up with hip looking young folks. I think Nan and Byron’s might be too cool of a scene for a homegirl like me, but just try to keep me away.